Tana at the park in October last year. 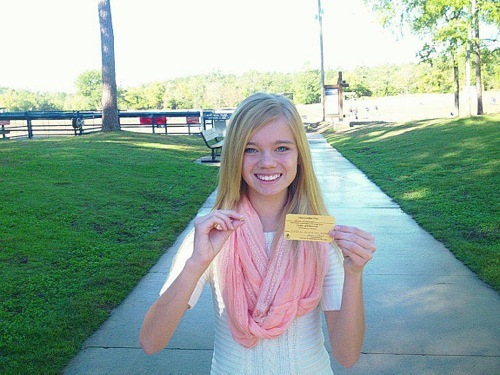 Tana Clymer, the lucky 14-year-old girl from Oklahoma who last year found a unique a 3.85-carat jellybean-size, teardrop-shaped, yellow diamond in an Arkansas state park has sold it for $20,000. According to Canadian Press, Clymer told TV station KWTV that she plans to use the money from the recent sale of the rock she named "God's Jewel" to help pay for college. Crater of Diamonds State Park is the only American diamond-producing site that is open to the public. More than 75,000 diamonds have been found at the properly named park since 1906, where visitors are allowed to keep their discoveries. The largest diamond ever found in the US, the 40.23-carat "Uncle Sam," was unearthed there in 1927. 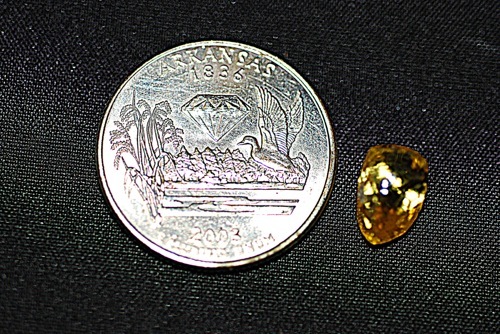 In August a 12-year-old boy unearthed a 5.16-carat "honey brown diamond" after just 10 minutes of searching. And last month, a Louisiana man on a family field trip found a 2.89-carat white diamond at the park. He named it the "Jax Diamond" after his infant son, Jackson.